KAMPALA – Bank of Africa have announced they will commence criminal proceedings against the bank staff suspected to have leaked the accounts of dfcu Managing director Juma Kisaame. 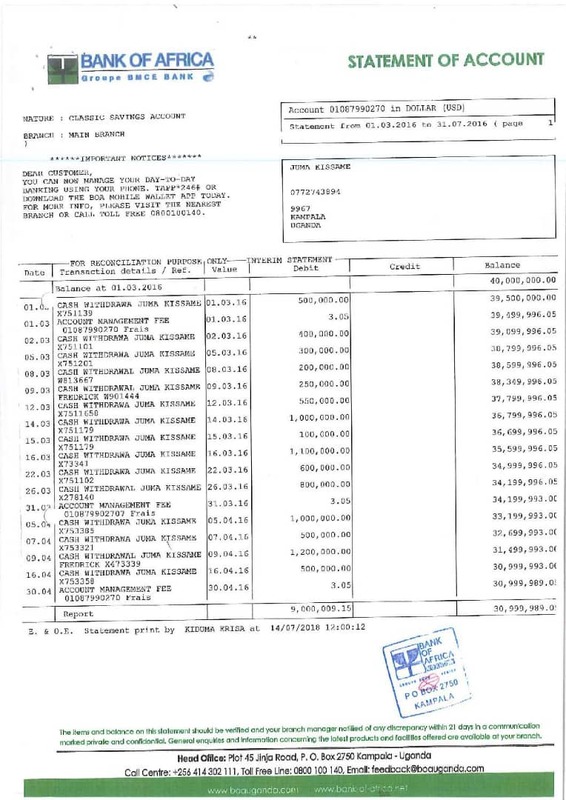 A leaked bank statement of account belonging to Mr. Kisaame, who is currently under the stoplight in the aftermath of the dfcu takeover of the Crane Bank fallout, went viral over the weekend indicating that the senior banking executive had $40 million on his Bank of Africa account. 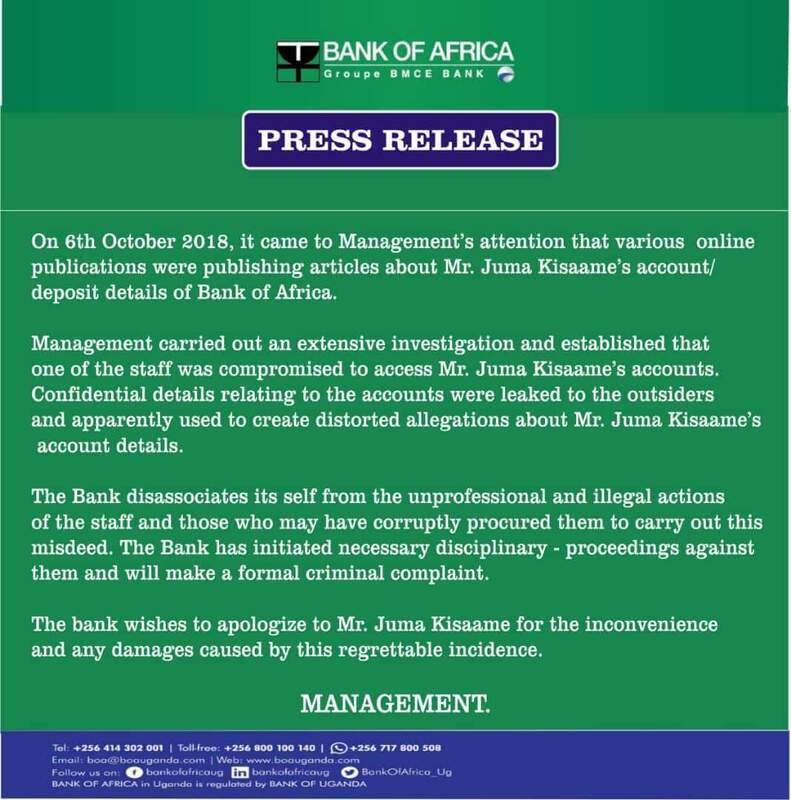 In a statement issued on Monday, the Bank of Africa apologised to Mr. Kisaame for the breach and said staff involved would be reprimanded and handed over to police for criminal investigations. 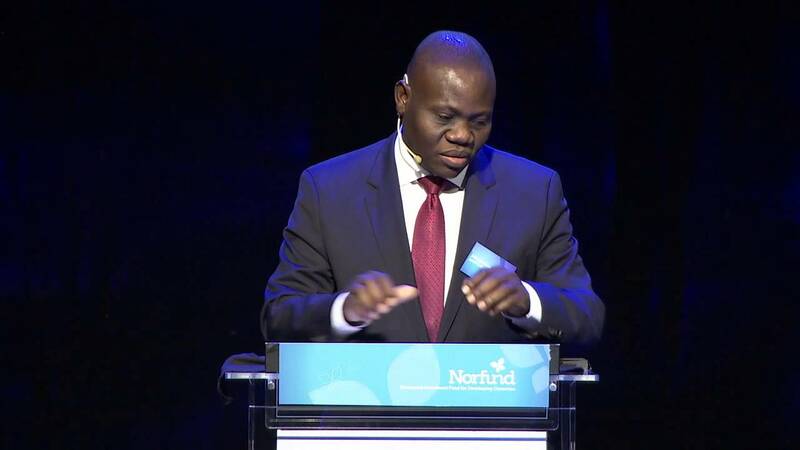 “The bank disassociates itself from the unprofessional and illegal actions of this staff and those who may have corruptly procured them to carry out this misdeed,” the statement said. Mr. Kisaame and dfcu have been in the spotlight following the bank’s takeover of Crane Bank in January 2017. Dfcu is said to have negotiated with authorities at BoU to buy Crane Bank Limited at Shs200 billion but as per AG report, only Shs90 billion has so far been paid to the central bank. Reports indicate that ever since dfcu controversially acquired former Crane Bank from BOU, the bank’s management has been struggling to manage business countrywide and that a big number of employees have since been shown the exit amid shareholder troubles. CDC, dfcu’s oldest partner made an official communication to DFCU indicating the intention to sell its stake on June 14.